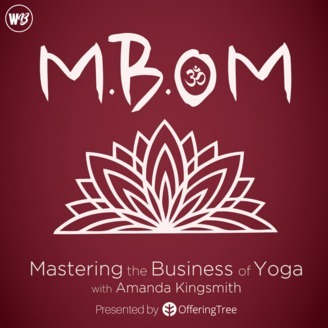 Mastering the Business of Yoga (M.B.Om for short) is a podcast was designed for yoga teachers who want to create a successful and sustainable career in yoga, but don't know where to start, or how to take their career to the next level. 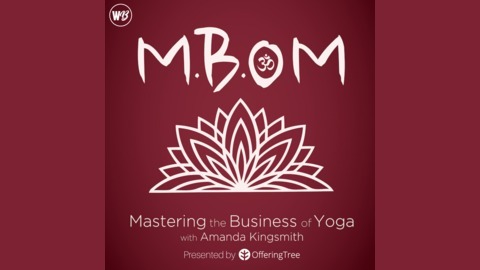 Each episode features different, successful and inspiring yoga teachers who share their experiences in the yoga world, and the business lessons they have learned throughout their careers. Guests range from full-time yoga teachers, yoga studio owners, teachers who have branched off to create their own businesses, teachers who have developed their own teacher training, and much more. This week on the podcast I am joined by Katie Brauer. Katie is a yoga teacher, a former professional snowboarder, a former executive of the fastest growing boutique yoga studio in the US and the creator of The Yoga Professional Incubator. On this episode, Katie and I talk about yoga, the business of yoga, why it's important to be an "entrepreneur" in the yoga industry, as well as the money side of yoga and how we can blend money and spirituality in a way that feels authentic, and much more. Want to join me on a tropical adventure in Costa Rica this fall? Meghan Pherrill and I are co-leading a retreat for yoga teachers at the beautiful Bodhi Tree Yoga Resort November 2-9, 2019 and we'd love for you to join us. This episode is brought to you by BeYogi. BeYogi is an online resource dedicated to providing yoga teachers and students with the inspiration and information and insurance they will need during every step of their yoga journey. BeYogi has drawn from their knowledge of the yoga world to not only create incredible content, but to also provide yoga and wellness professionals with the insurance coverage they will need to expand their careers. And, I don’t know about you but I know that I run into a lot of places that won’t let me teach or offer anything if I don’t have insurance, so this is definitely something that if you don’t have you’ll want. And they have incredible things like online teaching coverage so no matter what style you’re teaching or wherever you are in the world, give yourself a little peace of mind knowing that you are covered should something happen. Head on over to beyogi.com/mbom to learn more or to get coverage today. I am super excited to announce a new partnership with Schedulicity! Schedulicity is an online booking software that allows you to do everything from booking clients, to taking payments, to communicating with your clients. I personally love Schedulicity because I can do all of my bookings through one easy platform. This week's Schedulicity hot tip of the week is with Blake! If you've been wondering how an online schedule can help you with your business, email Schedulicity at support@schedulicity.com or visit schedulicity.com for a chat with one of their support rockstars! Has your yoga studio’s growth become stagnant? If you’re like many studio owners I talk to, you’ve tried every marketing tactic under the sun. You started a blog, you’re posting regularly on all the social media sites, running challenges, sending out newsletters blah blah blah. Long story short, you’re doing a TON of work… and barely paying the bills. What if there was an easier way? A way to get new students regularly coming through your door without having do work so darn hard to get them there? A Proven system that will consistently bring in 20+ new paying students to your studio each and every month? Well there is…. Ron Medlin and his team at www.getyogastudents.com have developed a 3-step system that will help you quickly grow your yoga studio to 6-figure profits and beyond without being shackled to your business.